Unfortunately the credits only reveal the voice actors involved without stating which characters they voiced. 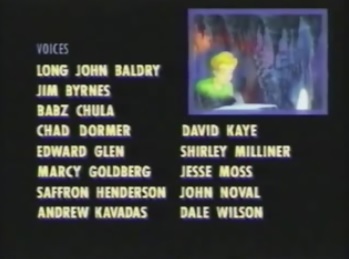 The two most notable names to me on the voice credits are Long John Baldry (who voiced Robotnik in The Adventures of Sonic the Hedgehog) and David Kaye (Megatron in Beast Wars). 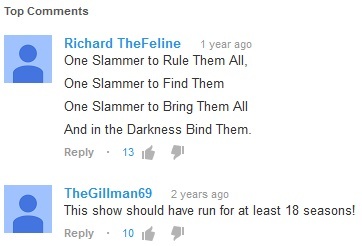 I'd like to say David voiced Shadow Slammer, but I don't know for sure. Andrew Kavadas voiced Simon Belmont in Captain N: The Game Master, whilst one of Saffron Henderson's other roles was Sakura in Street Fighter. Special thanks to Rob of Planet-Rob.com as he uploaded the episode to Youtube and his upload is where I got the images for these pages from. Q] Are there any more episodes? The first episode is the only one. Whether or not the plan was for more to be made is unclear. The ending to the episode specifically shows Ronnie find Sun Slammer again, and Von Fragman is still around. Also the writers may have had some kind of plan in the long run, as there are 5 slammers of light. Ronnie has one of them, and early in the episode he is shown hanging around with 3 friends, plus there is also his guitar teacher. Perhaps they were meant to get one slammer each. I don't know if Von Fragman was meant to get all of the slammers of darkness back though.